People have different ways of understanding and describing yoga but not many see yoga as a systematic complete discipline that includes practices for the physical part as well as the subtler layers of our beings. In the west most people associate yoga either with physical movements or with some type of eastern religion and meditation. However, although yoga promotes physical strength, flexibility and endurance, it is not just exercises. Yoga develops concentration and quiets the mind, but it is not exactly meditation. Yoga, though rooted in Indian culture, it is not a religion, as you don’t need to believe in anything in particular or give up your own beliefs to practice yoga. So what is yoga? In Sanskrit, the ancient language of India, the word yoga means “yoke” or “union.” Yoga is a holistic practice which unites the body, mind, and spirit to create a greater connection with one’s pure, essential nature. The ultimate goal of yoga is to develop the meditative mind to gain the union of the inner self with the Higher Self. Throughout at least 5 thousands years of yoga history, many different methods to achieve the union were developed. Among major branches of yoga are karma yoga, jnana yoga, bhakti yoga, raja yoga and hatha yoga. Karma yoga, the path of “action”, teaches us how to achieve the union by practicing mindful behavior and selfless service. Jnana yoga is the “wisdom” path, which leads us to the union through mental understanding of truth as it is described in ancient yogic texts. Bhakti yoga, the path of “devotion”, concentrates entirely on divine worship and surrender to God. Raja yoga is the “royal” path that emphasizes the importance of meditation as a way to achieve the union. The type of yoga that uses asanas and pranayamas to encourage deeper body-mind awareness is known as hatha yoga. 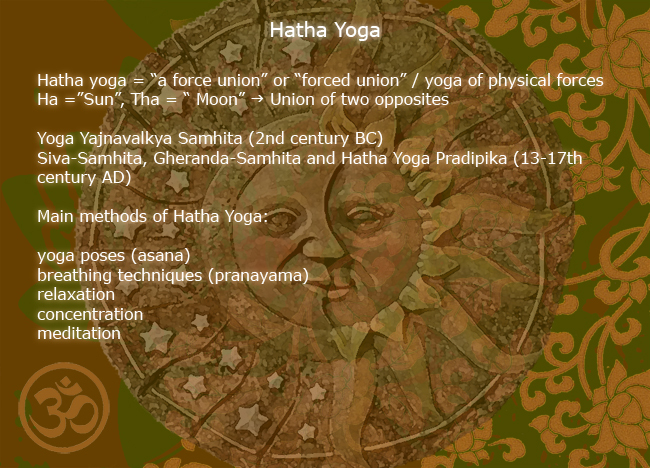 The word hatha is a compound of the words ha and tha meaning sun and moon but when the two components are placed together the word hatha also means forceful, as powerful work is needed to purify the body and to balance opposites within a person – sun and moon, male and female, positive and negative, active energy and receptive energy. Only a balanced person is healthy, content and happy. Any yoga, which involves physical exercises, is hatha yoga, so it is a generic branding, so to speak. It’s like plain yogurt. And there are many different schools and styles, which are like varieties of flavored yogurt, for example Anusara, Ashtanga, Bikram, Iyengar, Kundalini, Shivananda, Vini yoga, etc. All these schools allow anyone to find a yoga style which will suit one’s needs and preferences. Hatha yoga is low impact on the bones and joints and yet has high impact on your health. Hatha yoga is the most widely practiced exercise system in the world, since the 1970s when yoga was introduced to the western countries.